It’s almost Thanksgiving! My folks are already in town doing shopping and advance preparations for tomorrow’s cooking and feasting. This year, we are excited to welcome my friend Margaret’s family over for our celebration on Mendenhall. Merging of traditions is always a fun time – especially, when mixed with North Carolina oysters, Florida stone crabs and a bourbon cocktail. I can’t wait to report with recipes, photos and stories. Now to brussel sprouts. There is no doubt that both kale and brussel sprouts have been at center stage on Mendenhall this year. I love their hearty nature and I’ve recently discovered their perfection in almost all forms – cooked and raw. 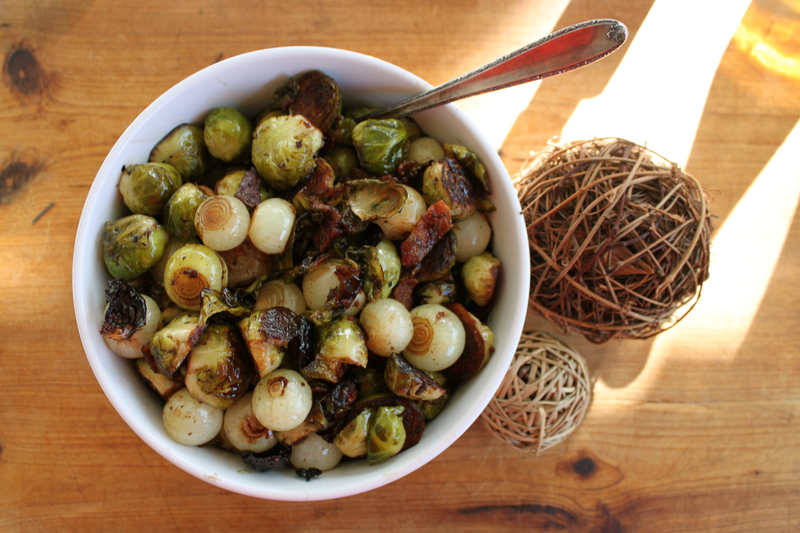 I’m looking forward to preparing my favorite Balsamic Roasted Brussel Sprouts with Bacon tomorrow. They are now famous too – featured in this week’s Triad City Beat! Check out the article today on local foodie’s favorite Thanksgiving sides. And, if you’re interested in the recipe – check it out here. Now, back to my love of kale. Lately, I’ve been making an extremely delicious and healthy salad with raw kale and raw brussel sprouts. I found the recipe on Just a Taste. It’s crunchy, has a wonderful dressing of lemon and shallots and will shock anyone with it’s deliciousness. If you’re looking for a last minute Thanksgiving recipe – this might be it. Or, you could commit to only eating this salad the day-after-turkey-day for an appropriate cleanse.